IRVING PARK — Angel Carbajal was returning to his Irving Park home from Home Depot on Wednesday morning when he saw a man sprinting down the middle of his street, running from the scene of a car wreck. He then saw his neighbors running after the man. "I said, 'Why is he running?' " Carbajal said. "Then I see the mess." 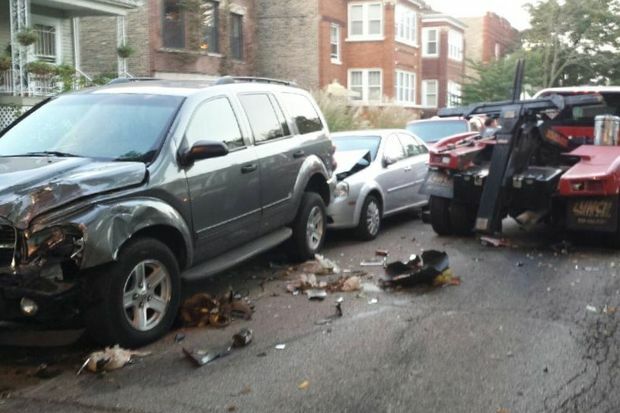 Around 7 a.m. Wednesday, a driver for Rosehill Towing and Recovery Inc. was going the wrong way down the 3300 block of West Cuyler Avenue when he hit a speed bump, neighbors said. The driver went over the bump "way too fast" and crashed into cars, damaging seven of them, said neighbor Sharon Costanza. "You hear something hit the ground," said Costanza, who heard the crash but didn't witness it. "Boom, boom, boom, boom, boom." Five of the cars were towed from the scene and were most likely totaled, neighbors said. 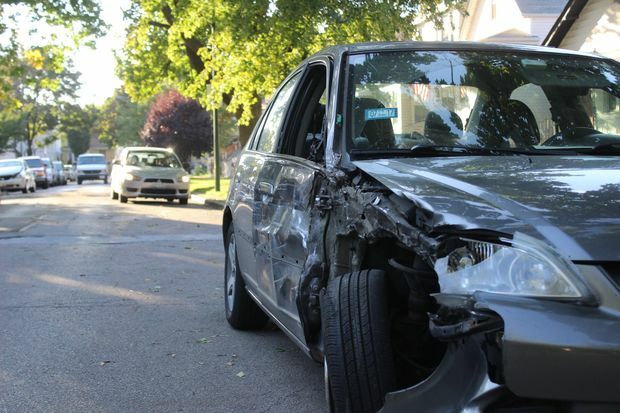 Two cars that remained on the block Wednesday evening suffered heavy front-end damage, including Carbajal's, he said. "It was bad," Carbajal said of the damage his car suffered. "We'll see what happens." The tow truck was also likely totaled and was towed away from the scene, neighbors said. After the crash, the tow truck driver tried to run away, but neighbors followed him and told police where he was, Costanza said. The tow truck is owned by Rosehill Towing and Recovery Inc., according to photos taken by neighbors at the scene. Patrick Worley, of Des Plaines, is listed as the president of Rosehill Towing and Recovery Inc. in state records, and he listed himself as a driver and CEO for the company on Facebook. Rosehill Towing and Worley could not immediately be reached for comment on Wednesday. Police could not say if anyone had been charged or cited in the crash, but they did confirm a truck hit a parked car on the block and no injuries were reported. The neighbor, who asked that his name not be printed, said he heard the tow truck hit the speed bump. He then hit three cars parked on the north side of the street, bounced off those cars and hit two cars on the opposite side of the street before bouncing off those cars and hitting the man's "newish" Subaru Crosstrek, he said. "I was right inside the window. My car was in the air," the man said. "I saw him and he started running." The man said his daughter was getting ready for work at the time of the crash and usually drives his Subaru to her job. "She could have been in the car," he said. "I've never seen nothing like this happen."